At first, everyone’s lawn looks fantastic. The grass grows fast and thick after every cut, and the yard is practically glowing! However, over time, your yard soon loses its luster. Your grass begins taking a longer time to recover after maintenance, and it’s changed to a dull yellow or even a brown color. What can you do to restore your yard to its full thickness again? Often, people turn to whatever products they can find at their local store. Unfortunately, these chemicals may make an unfortunate situation worse, and may even be the thing that kills your grass entirely. Instead, Lawn Works suggests hiring the natural and safe alternative. 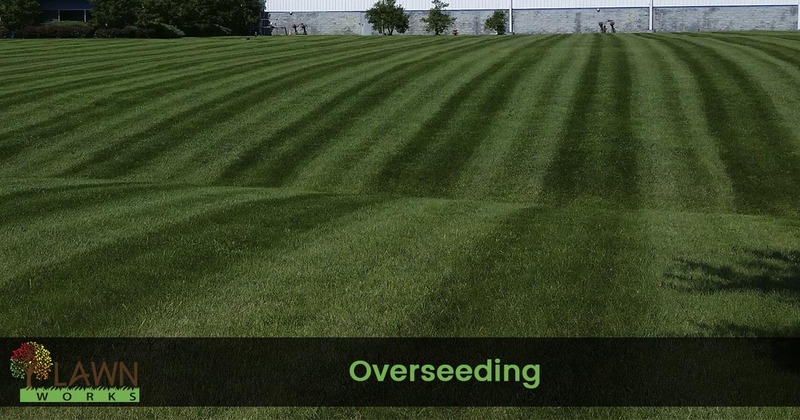 Our overseeding process is an industry-accepted technique that achieves results quickly. In fact, professionals usually consider it among the best things a homeowner can do for their lawn! You can think of overseeding grass as hair plugs for yards. By using a wheelbarrow-like seed broadcaster, we coat your yard in new grass, which will fill in the areas where it’s already burnt out. Despite how lively grass is, it’s still a plant. Sudden cold weather, too much or too little water, and even too much direct sunlight will cause them to wither away. Every lawn will eventually require new grass at some point or another. Overseeding is something that can potentially be a DIY project, but it’s far from a simple process. A homeowner would need to rent or purchase an aeration machine, which may be hard to find. They would then need to research what grass species would grow best, the proper soil pH balance, and other confusing factors. That is why we recommend calling our team for your yard needs. Our expert technicians have all the proper tools and equipment and know what your home needs to look its greenest each time. For the best results, it’s recommended to start the overseeding process immediately after aeration. And coupled with our core aeration and dethatching services, your yard could look like new again! The aeration process allows for increased oxygen and water to flow back into the soil. Over time, root systems, dirt clods, and other factors begin to choke your grass, leading to it dying out. However, after aerating your yard, your new seeds have the best opportunity to germinate. Considering seeds are a favorited snack for birds and animals, you certainly want them to take as soon as possible. That is also where the name of the process got coined. By deliberately overseeding your yard, you have a better chance of filling it in on the first try, even after some seeds get eaten. There are other alternatives to this overseeding method, but most lawn care professionals would agree that this is the best way to do so. However, if we believe that your yard requires an alternative, we can discuss your best options. Call today for your top name in local overseeding services. You won’t believe how great your lawn will look in such a short amount of time!